Moveable through 4 castors, 2 with brakes. Perforated bottom and tray can be taken out for cleaning purposes. 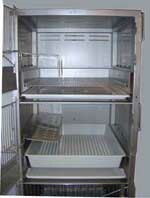 Back wall of cage is made of stainless steel plate with diagonal settings for extra support. Plastic side walls are easily removable. Optionally available with clear Polycarbonate side walls). Each cage with detachable wire door, food hopper, botte holder and drinking bottle with stopper and drinking tube. Optionally available: a shelter for the cage (inner cage). Overall dimensions rack: 1.901 x 800 x 927mm (H x W x D). 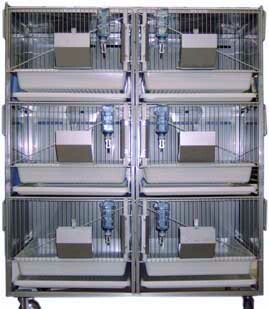 Cage rack 2 * 3 cages. Back wall of cage is made of stainless steel plate. Plastic side walls are easily removable. (Optionally available with clear Polycarbonate side walls). Overall dimensions rack: 1.860 x 1.530 x 912,5mm (H x W x D). 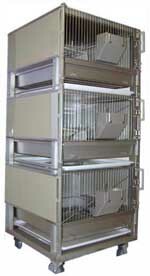 Cage rack 1 * 2 cages. Clear Polycarbonate side walls are easily removable. Each cage with detachable wire door, food hopper, hey rack, botte holder and drinking bottle with stopper and drinking tube. Overall dimensions rack: 1.815 x 780 x 940mm (H x W x D).